Glen Owen Burnett was among the first wave of Gospel preachers coming over the Oregon Trail, although the first saints arrived in the Great Migration of 1843. While John Burris Smith was coming up the Applegate Trail from the south, Glen was bringing his family over the usual Oregon Trail through The Dalles. 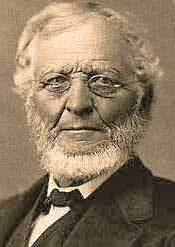 Another preacher in the wagon train of 1846 was Dr. James McBride and his family - old friends from Missouri. John Burris Smith and Dr. James McBride are the focus of separate profiles. It might help the memory to be aware that Glen's brother Peter had come to Oregon as the wagon master of the 1843 train, then moved on to California where he became the first governor. He had been converted to the ancient gospel in Missouri, but embraced Catholicism while in Oregon. Dr. John McLoughlin became his god-father. Glen Owen Burnett married Sarah Rogers (Peter had married her sister) and they had 11-year-old Horace and four-year-old Peter Rogers Burnett and five other children as they traveled the Oregon Trail. Eventually there were 11 Burnett children. Glen was 37 and Sarah was 28 on the trip. They were pioneering untouched land at the northern edge of present day Polk County, a few miles north and west of Salem. Like other married settlers, he was able to claim 640 acres or one square mile of grass and timber. Looking on a map, the land was about two miles east of present-day McCoy on Highway 99W. There is a profile of Peter Rogers Burnett. The Burnetts settled on the north side of Amos Harvey's property. There was a tiny cabin on the land and this is where they camped for the winter. There is a profile of Amos Harvey. "As the wagons neared the lonely spot, the wife and mother of the seven children belonging to the family, gazed with intense interest upon all the surroundings visible at that hour of the evening. Many long months of patient toil, and hardships had marked her journey across the wide plains, in quest of a little spot on earth she could call a home. We stopped in front of the opening, in the side of the rude hut; and for the first time, began to take what little of this earth s goods we had, from the wagons, and place those tattered fragments in our little house. This finished, and our frugal supper partaken of, we layed our weary bodies upon the floor to rest. Sweet was that night of sleep to us all. The morning came, and with it new responsibilities. I will never forget the sensations of that eventful period of my ministerial life." --From "Christian on the Oregon Trail," by Jerry Rushford. Page 70, second edition. College Press. The spelling and grammar of his original have been retained. Burnett organized the Bethel Church which flourished due largely to his strong, yet reverent and tender appeal and his scathing denunciation of sin. Burnett chose the name "Bethel" because it was the name of the last church he had served in Missouri, a town north of Jefferson City, Missouri on State Route 15. It must have been a pleasant ministry. He gave the name "Bethel Hills" to the heights north and east of Bethel, Oregon. The name is still in use. In 1846, the nearest U.S. Post Office was Weston, Missouri. These pioneers were isolated! Glen Burnett immediately became a circuit-riding preacher. Perhaps at first, he was a circuit-walking preacher. He preached in a school house at Rickreall, several miles to the south of his property. He preached in many developing villages, primarily in Polk County. After arriving in the fall of 1846, he walked north into Yamhill County, fording the Yamhill River at Elbridge Edson's place. His aim was to join Dr. James McBride on a preaching tour that would take them to the home of John Foster, another preacher- farmer near present-day Carver, in Clackamas County. The Harveys and the Burnetts shared a dream of building a Christian College in the newly opened Oregon Territory. Each donated a portion of their land to the project and the new town of Bethel was platted. They financed Bethel College by selling homesites at $100 for 2.25 acres each. This was about 10 times the going price for land outside of town. See a close-up photo of the Bethel College Building and to read more about Bethel College. To see the building from the slopes of the Bethel Hills, scroll down from the College building pictue. The college came into being, and most of the work of raising the structure was done in a single day by a huge crew that came from all over central Oregon. W. L. Adams had advertised the event in his Oregon Argus newspaper. That was July 4, 1855. The Harveys and the Burnetts had reached Oregon in 1845 and 1846 respectively. By the end of a decade, they had a school for grades one through high school and had launched a Christian College, all at Bethel. In 1855 the first store at Bethel was constructed. The town flourished with blacksmith shop, carpenter shop, wagon shop, and a general store. One of the stores was opened by John D. Kelty after he married Sarah, daughter of Amos and Jane Harvey. The College closed in a few years and merged with the new - and better financed - college at Monmouth. The building was eventually dismantled. When it is possible, I take my history classes at Northwest College of the Bible to the site of Bethel and we have prayer at the monument that commemorates the College. We pray that God will give us the kind of vision that these men had for proclaiming the gospel of the Lord in the Northwest. Glen Owen Burnett is a name inseparably linked with the opening days of Gospel preaching in Oregon. God used his vision, his hard work and the sacrifices of Sarah and the children, for progress of the church in the Polk-Yamhill area. In the Fall of 1861 the Burnett family moved to California so Peter R. could attend Hesperian College which was opening at Woodland. Glenn took up farming north of Knight's Landing and was involved in establishing a church there. Peter R. returned to Oregon and married while Glen Burnett remained in California. During 1877 the masthead of the Pacific Christian Messenger from Monmouth, Oregon began including G. O. Burnett as an associate editor along with T. F. Campbell and L. L. Rowland. From that point onward, the news of the churches was heavily weighted toward news of churches in Northern California. There is a profile of T. F. Campbell. There is also one of L. L. Rowland. I do hope, by the blessing of God, that you may accomplish great and lasting good in the land I lived in long ago, when I sometimes had to walk eight to ten miles to get the privilege to preach Christ to the poor. I have always esteemed it a great favor from God to permit me to preach HIS SON to the people. Some two or three years ago I made the effort to ascertain in how many places in Oregon I had preached. I ran up the number until it reached, if I remember, about 150 different school-houses, churches, barns, groves and in many places, for years. But my preaching days are over, and I am ready, I trust, to depart and be with Christ. Blessed thought! I want you to present my Christian affection to all the true and faithful in Christ Jesus, wherever you go preaching. And if it be God's will to turn your steps this way, I would like to see your face once more before I put off this mortal tabernacle. I would like to have you by my side when I am called to pass the deep, silent river, and to hear your cheers in the hour of triumph. They are buried in Santa Rosa, California. The very best source of information about the glory years of Bethel College is the out-of-print 70 page book entitled "Bethel, Polk County, Oregon" by John E. Smith and privately published in 1941. There is one copy in the Salem Public Library and one or two copies in other libraries of Chemeketa Cooperative Library System. Mr. Smith writes as an eye-witness to much of Bethel's development. It was his matter-of-fact story of Bethel that piqued my own interest in the nearly untold story of the Ancient Gospel in Oregon.